I read Hyper-V.nu great blog article about Christian Edwards script that checks both hosts and clusters for hotfixes and updates and found some things I wanted to improve in the script, first of all I wanted an object list instead of just some Write-Host with cool colors.. Then I can use the fabulous techniques of PowerShell to just show the once that I do not have installed or make a decent report for my cluster or just standalone hosts. Updated with hotfixes to 2013-07-15! Here is the script and the xml files with the extended DownloadURL are in this download zip file-> hyperv12updatescheck. Thanks, it worked awesome and big time saver. I have two enhancements requests that would really help us out. 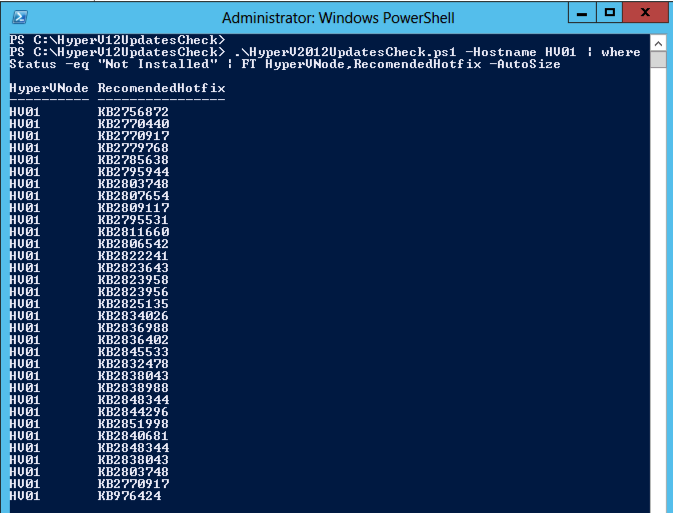 #1 – Add a PowerShell script switch that allows you to specify if you want to check Hyper-V, Windows Clustering, or both. For example we have non-HyperV clusters we would like to use this script for so we are using a single method consistently, and same thing for non-clustered Hyper-V servers. #2 – Add a PowerShell script switch and XML tag that allows you to filter out Windows Update issued hot fixes. We use WSUS here and so we don’t need to worry about those, and would really just like to focus on what we call “out of band” (meaning not issued through an automated mechanism from Microsoft) hot fixes. Do you have any plans to potentially host XML files somewhere like an FTP site so we could periodically check to see if there were updates like when there are updates to http://social.technet.microsoft.com/wiki/contents/articles/15576.hyper-v-update-list-for-windows-server-2012.aspx ? I could make the modifications to the script myself to do these things, but that would be a one off and I figured if we were looking for these features others might be as well (and this is your baby after all). Thanks for putting this together in the first place! I somehow missed the script came from a Technet site and you had added to it. I will cross post my request there as well. I stumpled across your comment on the technet blog _after_ I modified the script exactly as you did with basically the same features. I would be very interested in updating the script as requested in the comment of Dan Sheehan. Are you interested in updating your blogpost with the new script? The updates that show as “not installed”, do I need to install all of them or only if I am having some trouble? For me this script has downloaded “Windows6.1-KB976424-x64” on Windows 2012. This is a 2008R2 patch and not a Windows 2012. So I noticed, the xml files i took from Christian seems to have that in them, I will update my xml to not include that patch! Windows8-RT-KB2848344-x64 is obsolete and has been replaced by http://support.microsoft.com/kb/2870270 that is also included. I’ve started new project on GitHub that hosts this script and I currently work to create some improvements – see https://github.com/it-praktyk/Get-WindowsHotfixes . 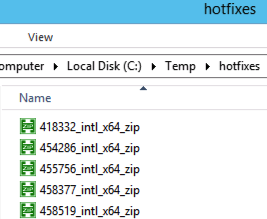 Today I’ve updated UpdatesListCluster.xml – list of hotfixes for Windows Server 2012 – information about KB2894464 was added. Please feel free to colaborate. 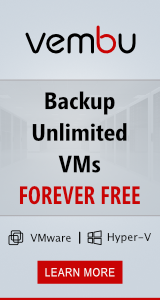 do you have similar for Windows 2008 R2 HyperV Platform ?